One that never made it. Looking back through some photos of work from the last 3 years I think I might have been onto something with this one. 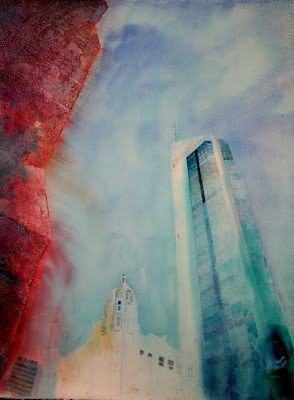 I recall using sand mixed with gesso on for the red structure on the left(the corner of a church). I think I ditched it due to the composition but there are areas I quite like. Hi Dave...interesting use of the gesso plus sand. How did it adhere to the surface? Also...what weight was the support? I am assuming it was a paper. Are you thinking of doing more work on this one? I definitely think it would be worth taking it further. Thanks for posting this one. It is good to see the ones that don't make it to the front line... and to learn about the artist's thoughts during the creative process. It's like Salzmann...without the photo! I think it's brilliant, Dake, I'd be thrilled to come up with something this bitchingly cool!!!! Thanks Sandy, just mix some clean sand with gesso and brush it on. It was Fabriano 650 gsm hot pressed. I actually destroyed it but I might start another in a similar vein after I'm through with the current run of desert ideas. I actually find this subject a little dry which sounds odd considering what I'm doing at the moment. Hi Patty, nice to "see" you again. NickO, I can see GF in it too, might be a good reason never to try it again!! Thanks for taking the time though mate! I like this, Dave....There is something about the two "pillars' in contrasting colors that is very strong. And the bird's-eye view adds to the feeling of strength.